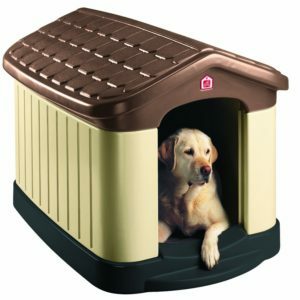 The Pet Zone Step 2 Tuff-n-Rugged Dog House has a spacious and roomy interior just right to accommodate pet dogs up to 125 lbs. That means your rather large dog no longer has to worry about having his own private home in the yard. So if you have a dog that is on the large size and you’ve been having trouble finding a dog house for him or her then this is the dog house that you should look into. It is also easy to put together and that is most important when you don’t have the time to build a dog house on your own. Spacious interior to accommodate large dogs up to 125 lbs. Assembles in minutes with no tools. Double walled, providing 10x the insulation as a single wall dog house. UV protection that lasts for years even in extreme climates. UV resistant to color fading. The plastic used in the Pet Zone Step 2 Tuff-n-Rugged Dog House is similar to that used in a children’s double-walled plastic play house or slide. It is softer than concrete, but you will still want to provide some kind of soft bedding for your dog. There really is no need to bother with trying to build your own wooden dog house. Unlike wood, this plastic dog house won’t rot, won’t leak, and it is much lighter and easier to clean than a wooden dog house. Interior dimensions are 36.5L x 27W x 28H inches. Doorway dimensions are 14.37W x 21.75H in. May not be suitable for very tall dogs like Great Danes (dogs over 3ft tall will fit inside, but may not be able to stand up in it and will have trouble turning around). Gigantic breeds might need something even bigger like a kennel. The Pet Zone Step 2 Tuff-n-Rugged Dog House come with double walled construction, providing 10x the insulation as a single wall dog house. Doors are sold separately so for hot summers they are removable, and can be reattached for use during windy or cold seasons. The house has a small rear sliding window just under the roof edge, making this dog house a comfortable and safe home for your pet. This dog house has easy assembly with lock together design and includes two panels. The door comes separately and the roof is removable. The heavy gauge door flap (size large) provides additional weather proofing by keeping wind drafts and rain out. It is easy to add and can even be done without drilling because the door flap comes with self-tapping screws and the dog house has 4 small indents marking the correct locations for the screws. The Our Pets Dog House Door (Size: Large) will fit the Pet Zone Step 2 Tuff-N-Rugged dog house. Lots of customers consider this to be one of the best dog houses on the market. They love that the assembly is super easy, the dog house is durable and that it has optional clear weather doors. Customers all agree that this dog house is the best constructed and will last the time. Their dogs prefer the air cushioned and elevated interior floor for comfort and a boarder guard on the inside keeps the bedding and blankets from sliding around. Other customers are satisfied that this dog house does not leak during heavy rain weather. There are customers who say that their rougher and tougher big dogs put bite marks into the house and might wind up damaging the insulation. However, other customers report that this house is very resistant to chewing because it has 2″ thick walls all around and durable rounded edges which discourage most dogs from chewing on them. Finally of other concerns to customers are that even though this dog house is made to last and durable once put together it is tricky to completely disassemble if a move would be necessary. You can read Pet Zone Tuff-N-Rugged customer reviews here.. The price might be a bit high but for a very durable and sturdy dog house for large sized dogs if is well worth it. Since you get all weather protection and double wall insulation. Is made of durable plastic and rugged. UV protection with colors that don’t fade. Extra insulation with double wall construction. Removable roof for cleaning interior. Door that can be added or removed. Ventilation hole at back can be opened or closed. Looks good in your yard or on your patio. If necessary to disassemble there is some difficulty. This dog house is made for just the purpose it serves – a sturdy and well built dog house for large sized dogs. It is easy to assemble so there is no problem when the dog house arrives. It has an easily removable roof for interior cleaning and a door that you can attach or leave off. Being light-weight means that you can easily position it, and it makes cleaning the house very easy. Since it is also well ventilated it is well worth to invest in this dog house that will serve your large sized dog for many years to come.